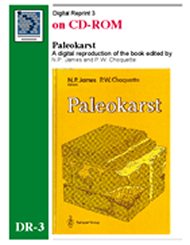 The enclosed CD-ROM contains a scanned version of the complete 1988 book, Paleokarst, edited by N.P. James and P.W. Choquette. The digital book has a total of 323 MB as pdf (tiff) formatted files. The publication may be viewed on a computer using free Adobe Acrobat software, and printed in part or in whole. Recommended Citation: N.P. James and P.W. Choquette, Eds., 1988, Paleokarst, Springer-Verlag, New York, 416 p.